The café is located at the new Gawler Green Shopping Centre on Main North Road, Gawler. Take the first exit ramp to Gawler and then you will see the shopping centre not too far along on your left. Saturdays is usually the busiest time as many people are visiting the area, or come for a party or family gatherings. I took two junior reviewers to assist me to give the playground a try out. 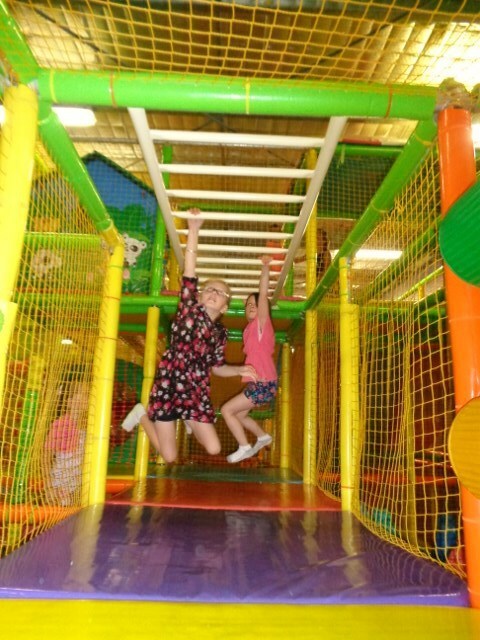 The playground is enclosed in a soft mesh fence and has many ladders, slippery dips and tunnels to run through. As soon as we found our spot at one of the café tables, our young reviewers popped on their socks and disappeared into the play zone. The younger one emerging occasionally to ensure we were still there. We adults were enjoying a delicious mug of hot chocolate. Later when the kids returned to our table, I asked what they thought of the facilities, and they said the playground is "super awesome". 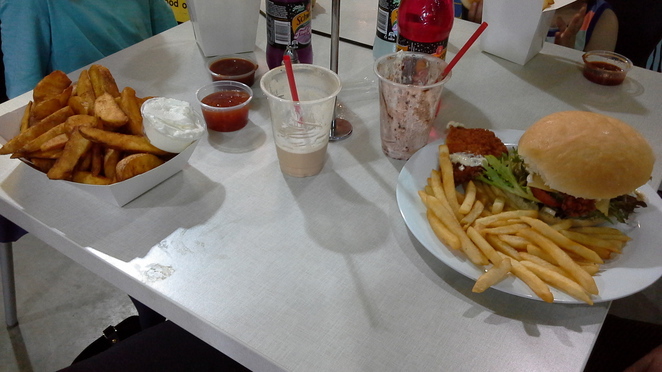 However upon thinking about it a bit longer they commented that they didn't like the biggest slippery dip. 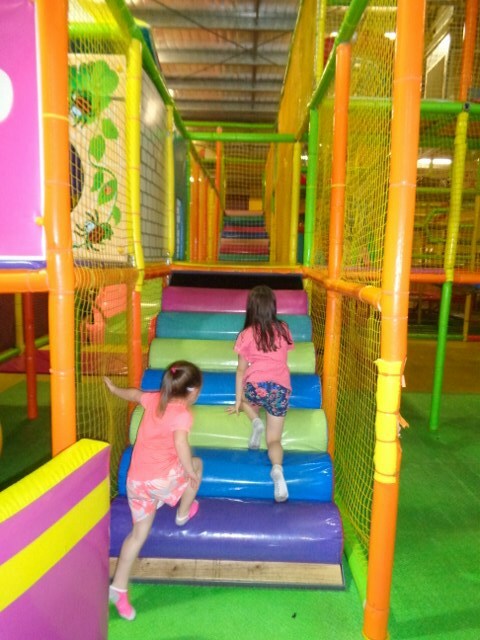 "It is made up of sections", said Miss Seven, "and when you try to slide on it you get stuck on the parts where it joins, so you have to push yourself across it and you can't slide down at all." However this child reviewer was not phased, as she is not into slippery dips at present. It is all monkey bars for her, and has the blisters to show for her bar swinging skills. 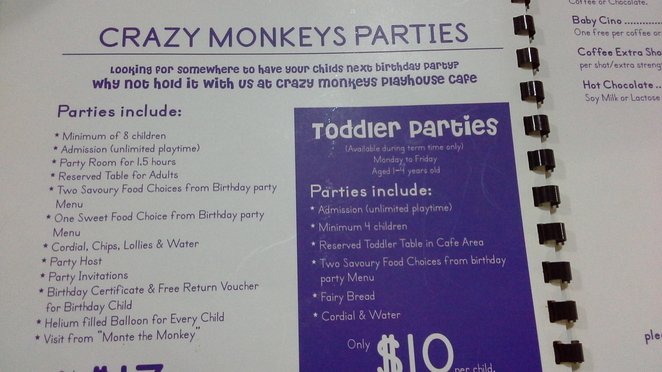 Crazy Monkeys does have a monkey bar, so it made up for the stuck in the tube slide. Happily swinging like a monkey. Image by Out and About. I walked around the perimeter of the meshed playground, to observe the structure. At the end of the slippery dip the children are supposed to fall into a large ball pit full of balls, yet there were very few balls in here. These need renewing to make the playground more fun for younger kids. 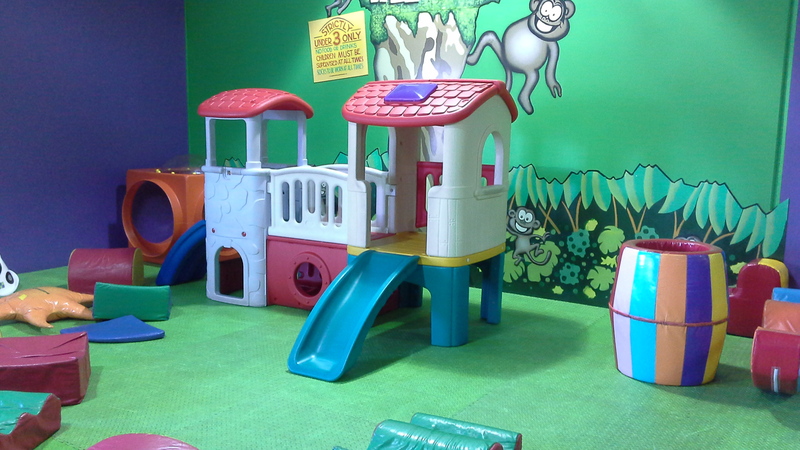 The rest of the play space looked adequate, with variations in height over three levels, having low areas and some parts with height for older kids to run around. 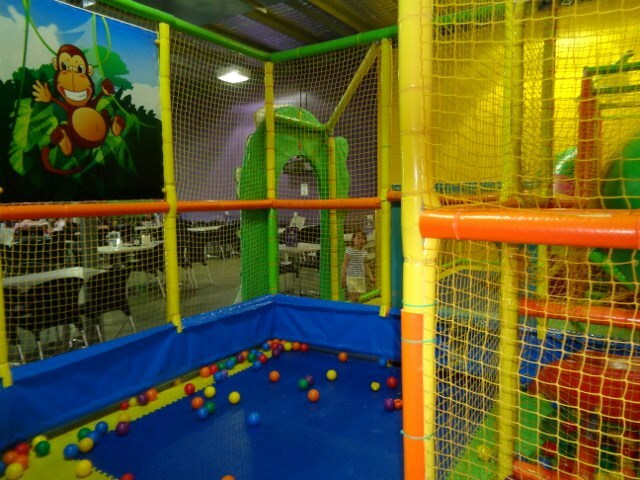 The practically empty ball pit at the bottom of the slide area. Image by Out and About. 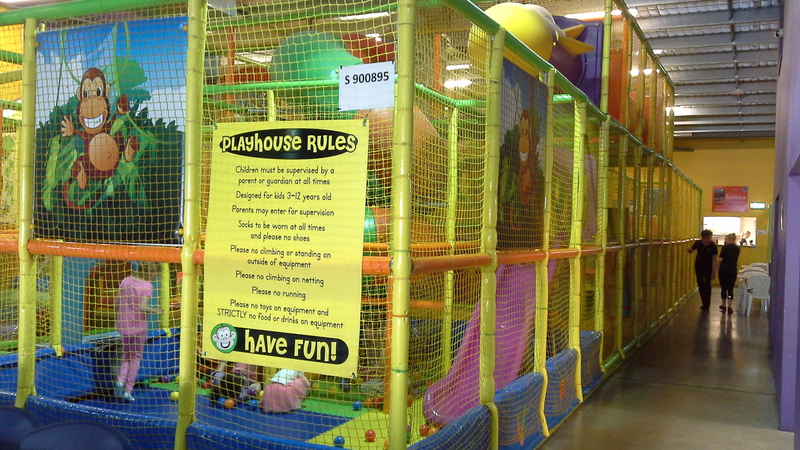 Toddlers are catered to with their own small playground, as they would get trampled in the big one. 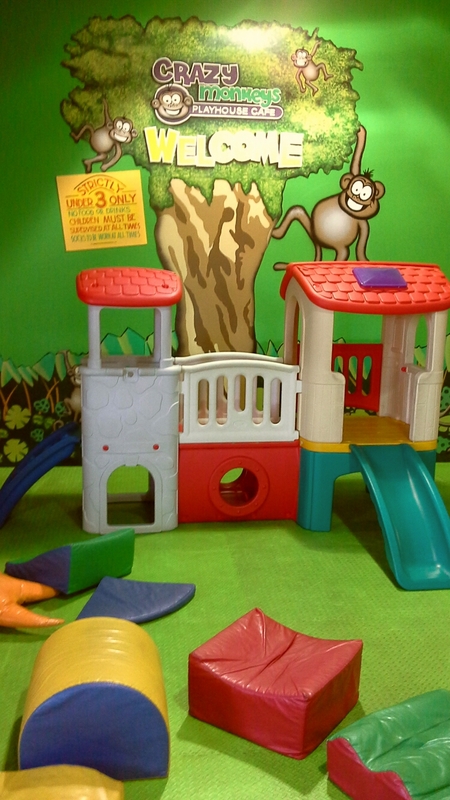 The toddler area is only for under 3 year old. It is fenced with a child lock gate and has large soft foam blocks. a mini slippery dip and a space to toddle around. Lots of options for kids birthday parties. Image by Out and About. This venue is a popular choice for birthday parties. 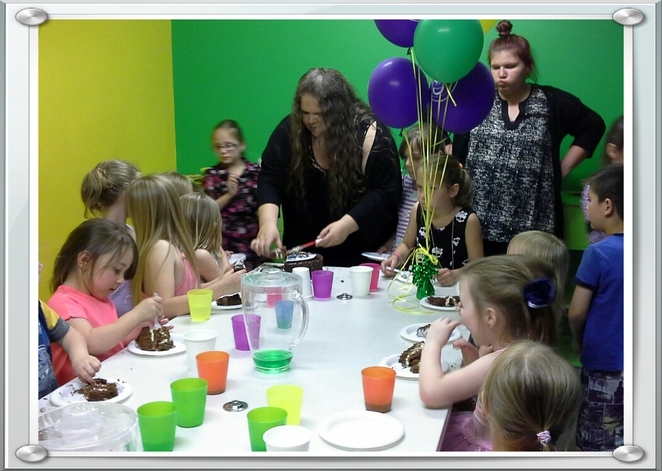 There are two separate party rooms which are set up with the party snacks and drinks. 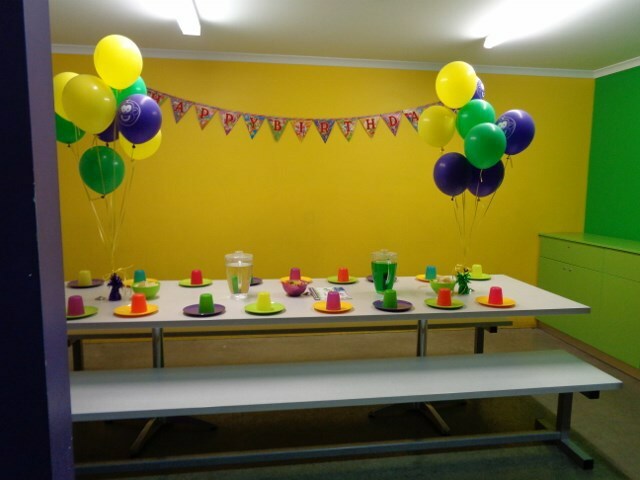 One room was set up for a party that day, and it looked inviting with brightly coloured balloons and cups. A party room set up and ready for the kids. Image by Out and About. 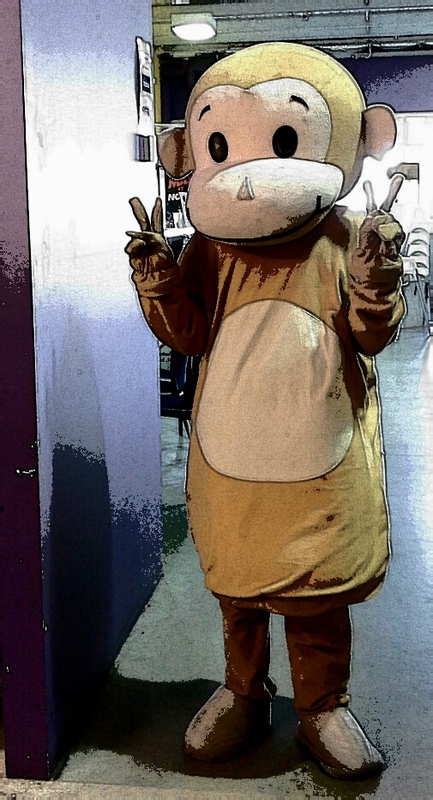 A special Monkey makes an appearance to wish a special someone a happy birthday. Image by Out and About. On Friday nights the place is a happy vibe with free face painting and balloon twists. There is a special entry price, currently $5 from 6- 8pm. Patrons can come for a meal and let the kids play afterwards. There is plenty of food on the café menu of the burger and fries type, with main meals also available for adults such as schnitzels. There is also coffee, juice and ice-cream in cones. Tuck in to the delcious tucker on the menu. I mage by Out and About. Another table space is toward the rear of the playground. 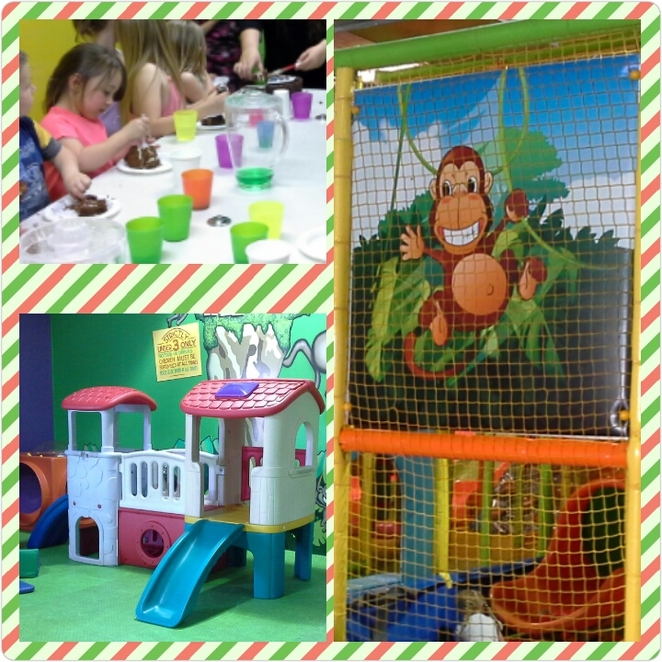 This has large tables, ideal for family groups or school holiday bookings. There is also some computer game play-stations for any older children who may find the playground a tad to childish for them. The toilets were clean and tidy. I found the staff to be helpful and polite, and there was plenty of staff on hand to attend to the customers. Large foam blocks for climbing on to exercise growing muscles. Image by Out and About. This all-weather venue would make a great place to take the kids on extreme heat days and also in rainy weather so they can still have a run around. With the cost of entry you would want to plan on spending at least a couple of hours here. during school holidays the venue is extremely busy and they recommend you call to book a table. Remember to take socks for the kids to play in. The venue is accessible by walking from the closest rail station which is Evanston, on the Gawler line. If driving, there is ample car parking in the shopping centre carpark. This is a popular and friendly café with locals and just perfect for hot and rainy days, or for visitors to the area who need some kids entertainment. Why? 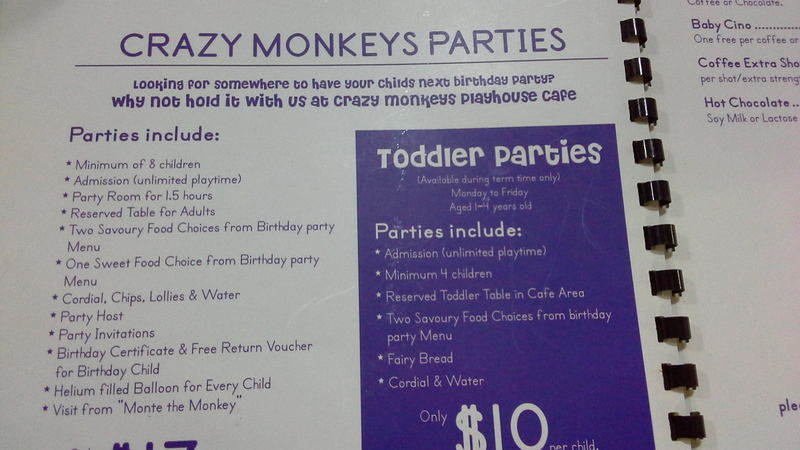 Because kids need a place to go crazy now and again. When: Monday to Thursday 9am- 5pm. Fridays until 9pm. Open some public holidays. Where: Gawler Green Shopping Centre, Main North Road, Gawler. Purple and Gold in one hit. Congratulations OaA!